We do not know what became of the sanjojiki (three mat room) and the fukasanjo-daime (tea room with three mats in a line extending inwards from the entrance, plus a daime three-quarter size mat). What we do know is that Sotan built a one-and-a-half mat room without a toko (alcove). It is conjectured that this was in Kan'ei 10 (1633). In a letter of July 28 addressed to Koshin, who was known as Soju at that time, it says, 'The framework of a small tea room was raised on the 23rd. Today a thatched roof is being put on.' In this letter we see that Sotan is looking forward to the completion of a one-and-a-half mat room without a toko (alcove) and his letter is full of joy at the prospect of its completion. It also puts us in mind of his absorption in preparations for the chaji to celebrate its opening. He was also able to invite the court noble Konoe Nobuhiro, the younger brother of Emperor Gomizuno and a great man of culture. This one-and-a-half mat room was built facing south. It had a thatched roof and was an ichijo-daime (one mat and a daime, three-quarter sized mat). The hearth was mukogiri (cut from the corner where the host's mat meets the guest's mat). The middle post (nakabashira) was of red pine with the bark attached, and a sodekabe wall was put in between it and the main wall, with a bamboo kabedome at the bottom of the wall and an open space between this and the floor. There is a suspended ichijudana (single shelf utensil stand) in the corner of the host's mat. The ceiling was a sloping kessho yaneura with the bamboo framework exposed. It was the simplest kind of building possible and it did not even have a toko (alcove). Rikyu built a one-and-a-half mat room in the Juraku residence. It was the first one to be built so it attracted a lot of attention. However, Koshin tells us that this kind of room did not meet with the approval of Toyotomi Hideyoshi. So Rikyu changed it into a two mat room. The one-and-a-half mat room that Rikyu built had a toko. Of course, because it was a wabi (quiet and simple) tea room, the alcove was murodoko style with rounded inner corners. Sotan eliminated even this toko and he told Koshin that it was a room that needed neither flowers nor a hanging scroll. 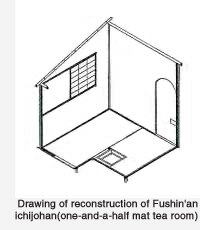 The one-and-a-half mat room without a toko was the extreme example of wabi-cha (tea of quiet taste). Sotan called this tea room Fushin'an and made it the symbol of Senke tea. On April 13 of Shoho 3(1646) Sotan wrote a deed of assignment handing on this tea room to Koshin and went into retirement in a house behind it.